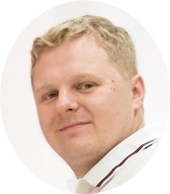 In this part I prepared some findings to test your (or maybe better to say our) knowledge. Let´s look at following pictures and answer the appropriate questions. The answer is always written under the picture. Picture 1 - What is in this picture and which clear pathologies can you see? 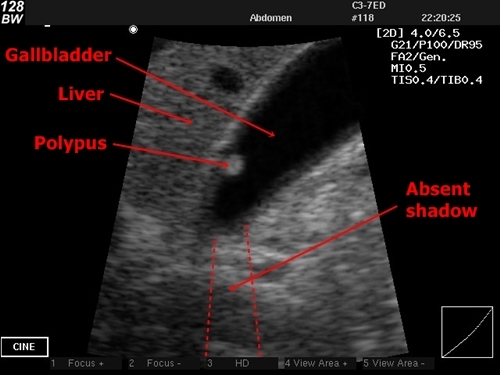 The liver has a rough echogenity and indirect margins, it is possibly a liver cirrhosis. 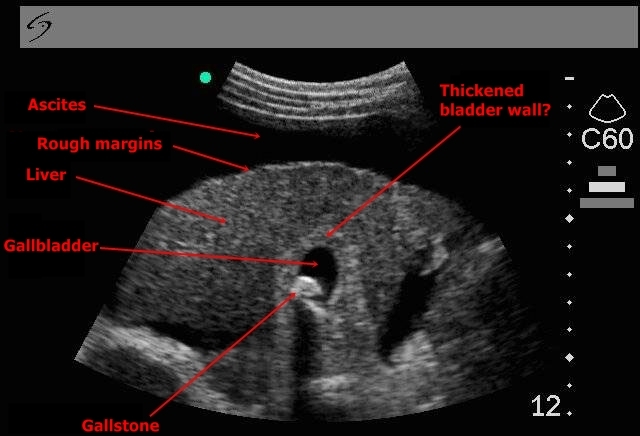 There is a stone in the gallbladder and an ascites around the liver. The wall of the gallbladder is thickened and in that case we could speak about chronic cholecystitis. This is, however, just a speculation because we can not measure the wall at the moment. Picture 2 - Which two organs can we see in this picture and what is the most probable diagnosis? Red line shows the position of the probe. 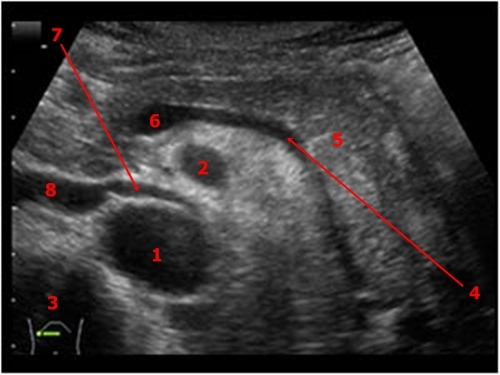 In liver tissue there are many round areas with hypoechogenic margins and more echogenic centre (marked by circles). These are typical signs of liver metastases whose diagnosis is the most probable. Picture 3 - This is a little bit more difficult. Which structures do we see in this picture and what is the main pathology? In upper right corner I marked the probable position of the probe (which should give you a big hint). There is porta hepatis in this picture. 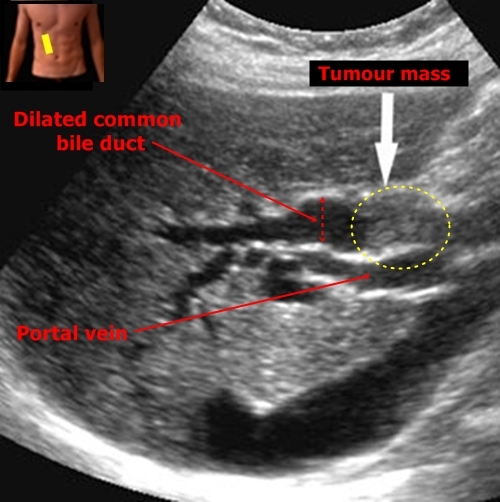 It is quite easy to distinguish portal vein and we can find a dilated common bile duct above it. 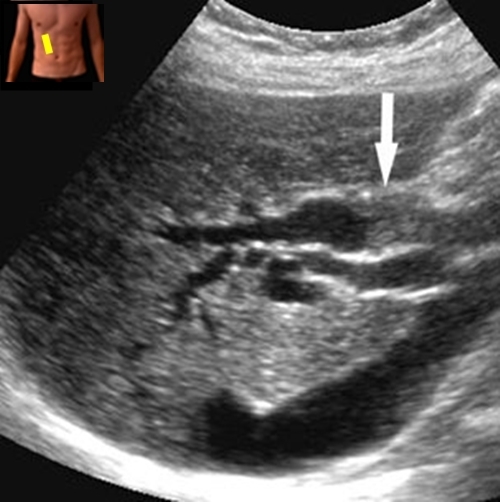 White arrow shows the cause of the dilatation - hypoechogenic grey mass closing the bile duct. It is possible a bile duct tumour. Picture 4 - Which structures are marked by those numbers? Picture 5 - Which organs can we see and which abnormal findings can we describe? In this picture there is a cut through liver and gallbladder. 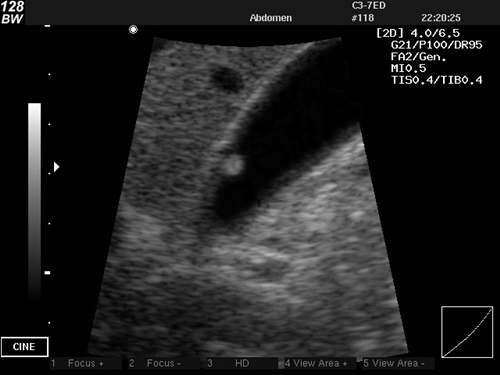 The gallbladder contains a grey structure near its wall. There is no shadow below this bearing so it is possibly a bladder polyp.